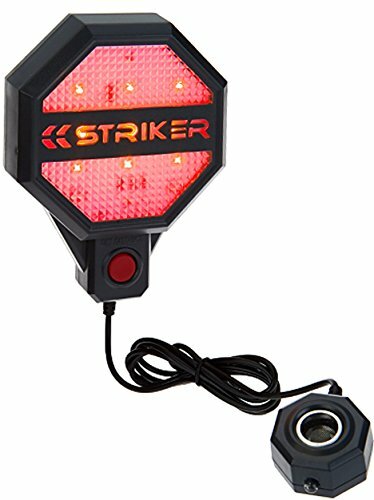 The Striker Adjustable Garage Parking Sensor is designed to take the guess work out of parking your car in tight garage spaces. It features adjustable, ultrasonic range-finding technology to accurately locate a vehicle within your desired parking constraints. Simply mount the sensor unit in front of the car at bumper level. Then mount the signal light in a position easily viewed from the driver's seat. Lastly, park your car exactly where you want it and press the set button. That's it! Next time the driver approaches the Parking Sensor, they will see a green light indicating that it is safe to proceed and then a yellow light will illuminate as a warning to slow down. Finally, when the car is at the chosen distance, a red light will illuminate, signaling the driver to stop the car. It makes parking it tight spots a cinch! The Striker Adjustable Garage Parking Sensor eliminates the dents and dings from garage "fender benders" and allows you to safely close the garage door every time. It is easy to install and comes complete with all mounting hardware, instructions and warranty. Striker Concepts is based in Mooresville, NC USA, and we are here for you! We design products from the ground up and take great pride in what we create. Making sure every customer is happy with their STRIKER product purchase is a priority. Whether it’s questions or concerns, we are here with answers. Our customer service team offers personal service and strives to insure every customer is 100% satisfied with our product. Due to our unique innovation, we are targets of copy products. Please beware of imitations. If you have any questions about this product by Striker Concepts, contact us by completing and submitting the form below. If you are looking for a specif part number, please include it with your message.